With two weeks and one day of school left, I am still plugging away with my students. Here's a peek at next week's plans! Grades 3 and 4: I tested 4th grade last week, so while they are on their field trip, 3rd grade gets to be my testing specimens. Then we'll have a little fun in the sun, and hopefully finish reading The Chocolate Touch, which they are loving so very much. 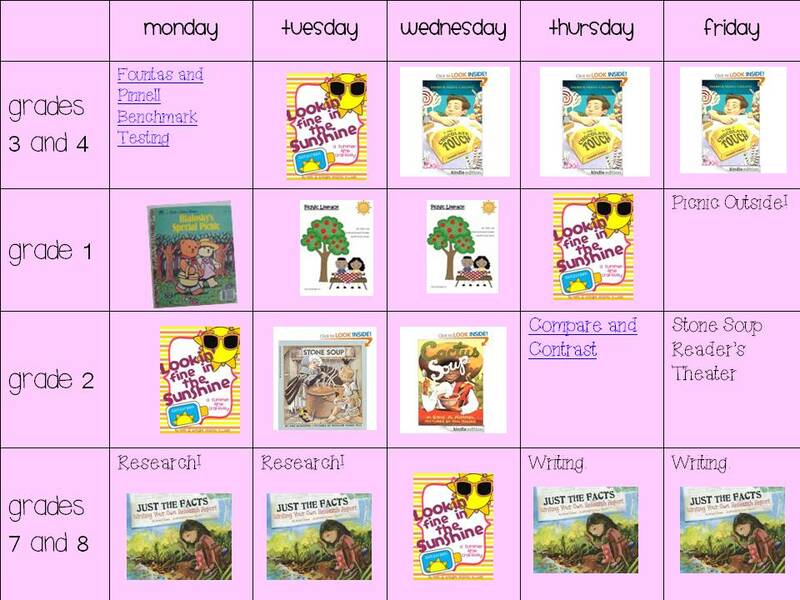 I'm planning a Reader's Theater for the week after- get excited! Grade 1: Did you ever read Bialosky's Special Picnic when you were a kid? It was one of my favorites. I have to dig it out of my parents' attic when I go to their house this weekend. It's picnic week for our 1st grade Storytown Guided Reader, so picnic we shall! Grade 2: We just finished reading Poppleton, which was so much fun to read with my three boys. They ate up Poppleton's vocabulary- he says things like, "What fun!" and "Certainly." Now my boys say those words too and it's adorable. Anyway, with two weeks left I'm not going to start a new GR with them. Instead, we'll do a compare and contrast lesson from my friend Amy to get them ready for 3rd grade. Grades 7 and 8: Oh my goodness. This is the research project from H.E. double hockey sticks- it's mandatory for the whole middle school. Luckily I have been using this great pack from Smart Chick, called "How to Write a Research Report." It has saved my sanity! What would we do without TPT? 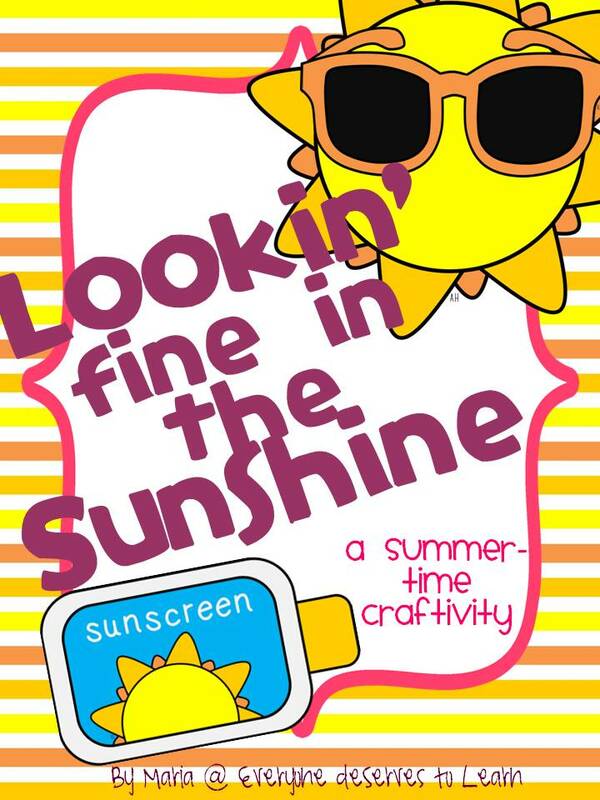 I'm so excited to work on my Lookin' Fine in the Sunshine glyph with my students! I want to have a nice bright bulletin board for summer school, and my students are pumped to design their own sunglasses! 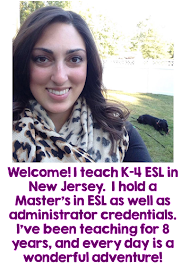 About a month ago, I was honored to guest post at Minds in Bloom, where I shared some tips for accommodating the English Language Learners you may have in your classes. I also shared a document the teachers at my school use to make their planning a little bit easier. The one I posted was only for grades 3-5. I received a few requests afterward to add one for 6-8; I did and am posting both here for you to use. Just click on either picture to go to the document. Now, WIDA is not aligned to any of the state or country-wide standards, so be conscious of the standards you are teaching while going through these documents. Here is the link for the WIDA site- you may find the original PDF's useful as well when you're looking to modify your plans or assessments. 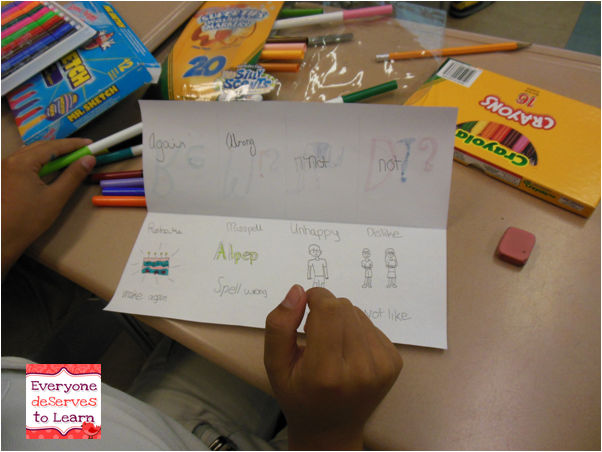 If you're a Language Arts/English teacher, you may want to check this out as well- the NJDOE has created a model curriculum that ties WIDA proficiency levels to the Common Core. 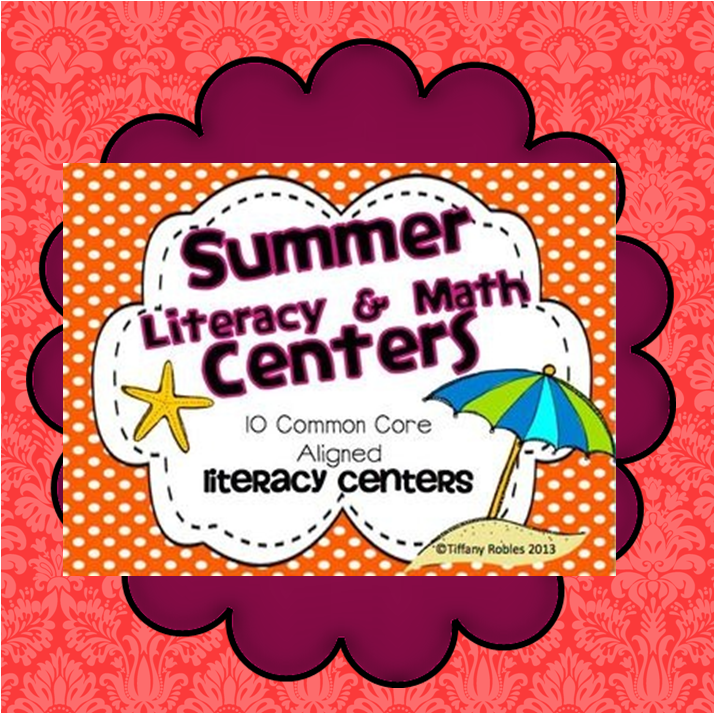 I have been piloting the program since January in my classes, and both myself and my teaching partner will be implementing it (adjusted to suit our students' needs and abilities of course) in September. Above is an example of the NJDOE Model Curriculum, which would work for any state using Common Core, and any classroom with ELL's. You can see the CCSS standard, all the objectives for that standard, then the correlation to the WIDA proficiency levels (in blue) which make it so easy to plan for the ESL students in your class! I hope this was helpful for anyone planning modifications! Send me an email if you have questions and I'll do my best to help out. 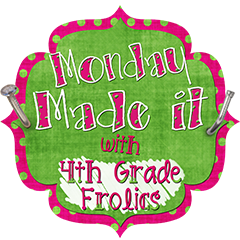 Teaching Prefixes and Suffixes and a Freebie! We're winding down our school year, and I'm trying to cram in the last few important things I need to teach before the end. Luckily, I will have most, if not all, of my students with me in summer school so whatever I don't get to, concept wise, I can address during that 4 week period. My teaching partner and I have some awesome things planned! But before that, we had to get through affixes. I saved it for very last as it's such a tough concept for ELL's- they need to know so many root words before they can go around adding prefixes and suffixes and understanding what they mean. 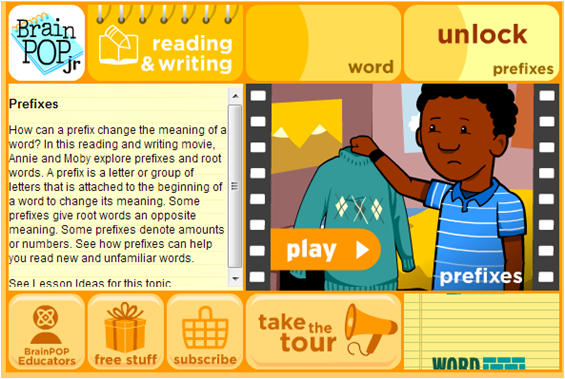 For prefixes, we turned to our good friends Annie and Moby. 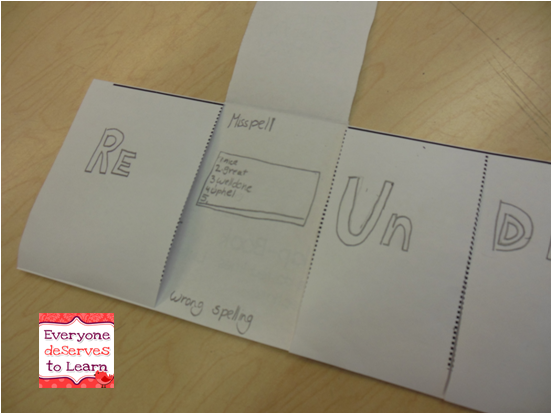 We learned un, re, mis and dis. Those were the prefixes I thought were the most important for my students to know. I had my students make a chart in their notebooks which they referred to throughout the week. We used these Prefix and Suffix Anchor Charts which were really helpful! 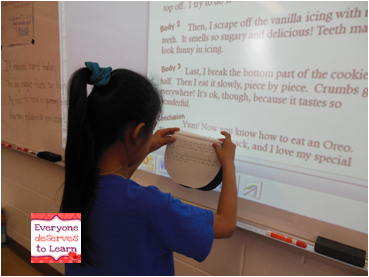 After our initial lesson, we reviewed orally and then played some games with our interactive whiteboard. 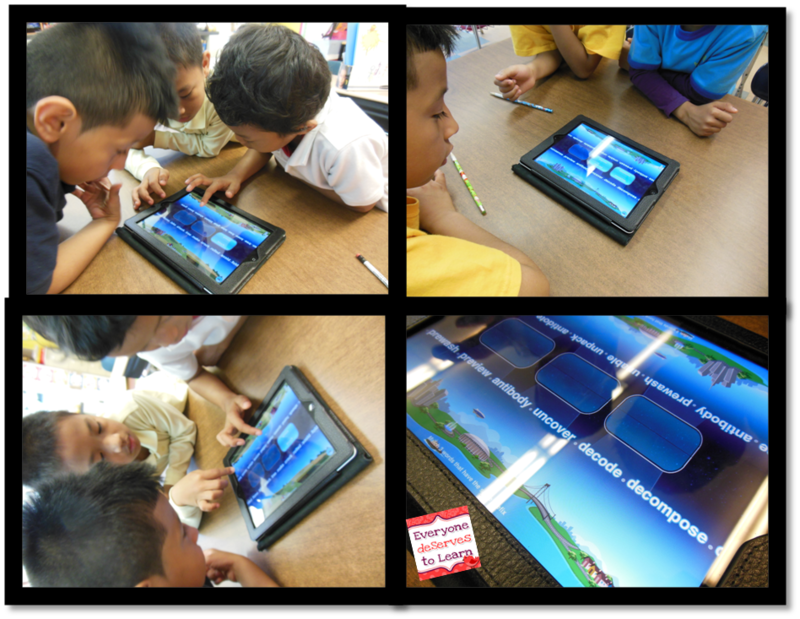 We also played Bluster on the iPad, which has a game for matching prefixes. Click here if you want to see my review! Last, I gave them a formal assessment, even though I knew they got it from doing the flap-books and all the other fun activities. Sometimes you just need to put something in Powerschool! If you need an assessment too, click here to pick mine up from Google Drive! I ended by giving them the suffix assessment from my freebie- see above! There are so many great prefix and suffix games and activities out there- I chose to go pretty techno this time, especially because my kids are so into using the iPad and the whiteboard. How do you teach affixes? After sitting outside for a one-person happy hour, I decided it was time to come in and share all the fun we were having this week. 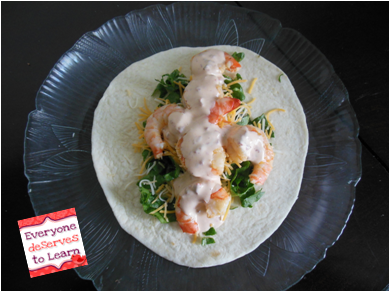 Peel and devein shrimp, toss in marinade and let sit for about 10 minutes. 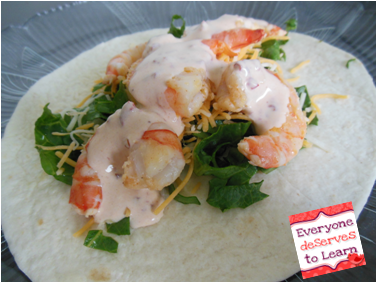 Grill or pan sear shrimp for about 3 or 4 minutes on each side, until shrimp are opaque. Reserve in a covered bowl if not using immediately. According to my husband, these were the best tacos he's ever had. But he says that about a lot of things I make... the mayo was so good I'm going to use the leftover as a dip for french fries! This was a great quick meal for a weeknight. 2. 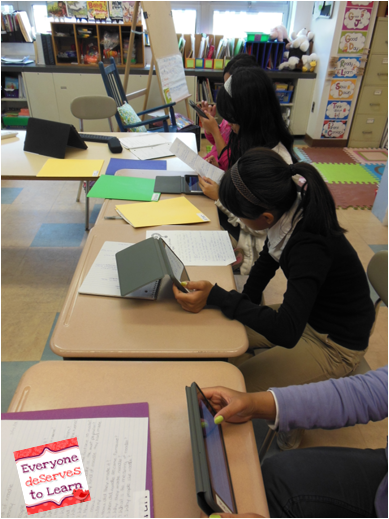 Research with Google Tablets- Our district bought two carts of Google Tablets, and my 8th graders have a research report to do. I don't have computers in my room, and it's hard to get into the lab when there isn't a class going on. So, tablets + newly discovered subscription to Ebscohost (yay!!) = happy teacher. 3. 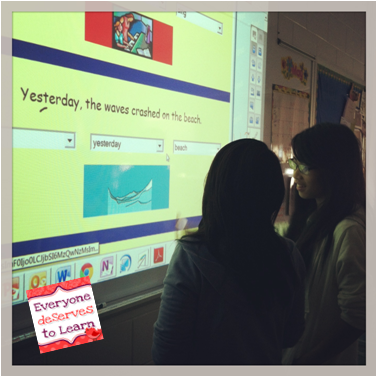 Working with adverbs. I am pretty sure I explained before that my 8th graders are lacking many basic foundational grammar skills. 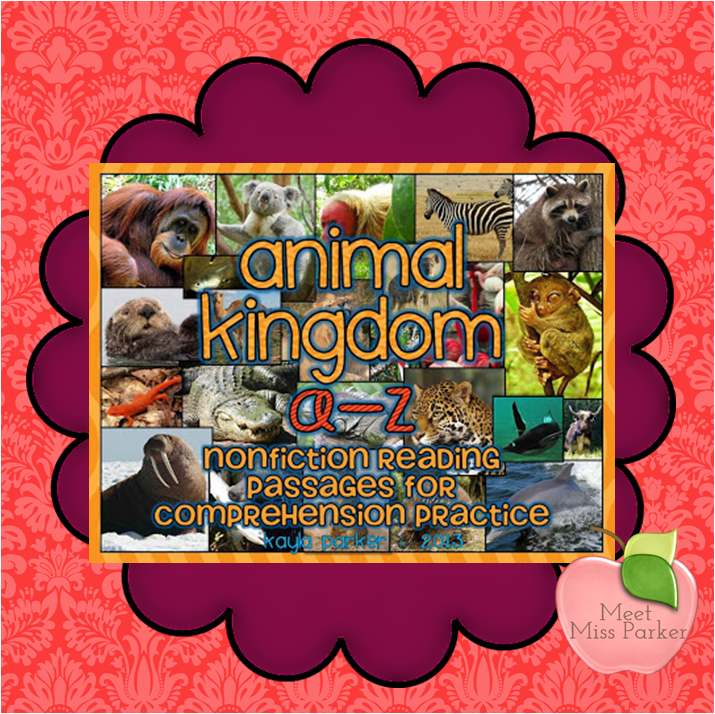 We did common and proper nouns last week, and I actually gave them the exact same test I gave my second graders. 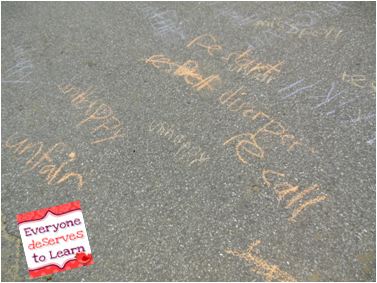 This week we worked on adverbs as our problem of the day, and some kids picked it right up, but adverbs can be tricky! This is a great website if your students need some extra practice. Me: "Give me a word that means not happy!" And they would race to write it. Simple and fun and planned while we were walking down the hallway. Now that's my kind of lesson. Don't tell my principal. 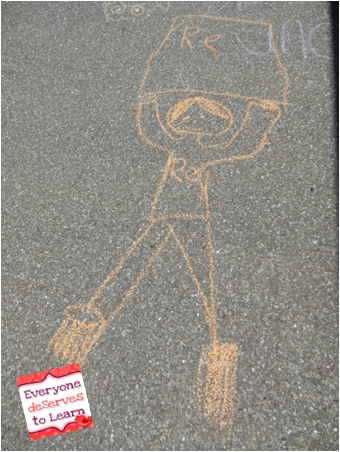 We had free "chalk talk" time after and one of my buddies made me "re-man!" 5. Kid-Tested, Teacher-Approved. 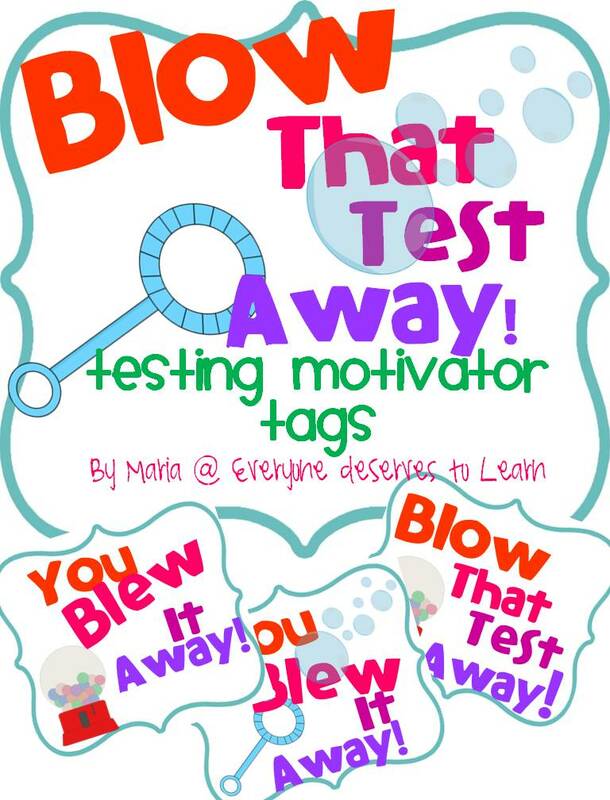 We used the free app Bluster (by McGraw Hill) all week, and I am giving it an A+ rating! Here you can see it in action- my students begged to play it again and again! It comes with matching rhyming words, synonyms and prefixes. You start on Level 2 for some reason, and the words are good for 2nd grade and up. 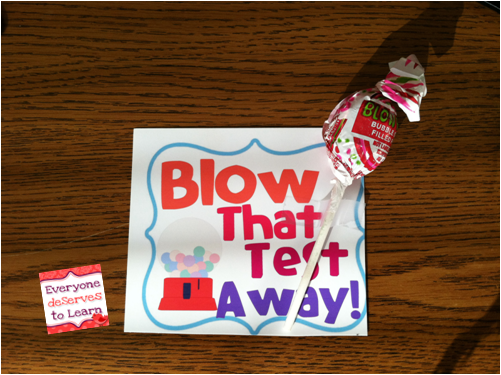 My students liked it because they figured out they could "beat the clock" to get a better score. We didn't learn all the prefixes they have in the app, but that was ok because it was teaching them word recognition- two of my students were great at it, but one really struggled. That helped me to see where his problems are in quick reading. If you don't have it yet, I suggest you download it! Do you use iPads or tablets in your classroom? What apps do you use? It's time for Monday Made-it with Tara! Spray a pan with cooking spray. On medium high heat, add the garlic and ginger, after 30 seconds add the soy sauce and water. Swirl around pan, add brown sugar. Cook over medium high heat for 3 minutes, then on low heat until sauce has thickened a little. Remove to a separate bowl. While sauce is thickening, shake meat and cornstarch in plastic bag- let set on counter for 5 minutes. In same pan as sauce, set heat to medium high and brown meat on all sides- if it sticks, it's ok! Add 1/4 cup of water to meat in pan, let bubble and reduce. Add soy sauce mixture, toss with meat and scrape up any brown bits from the bottom of pan. Add scallions and red pepper flakes, serve. 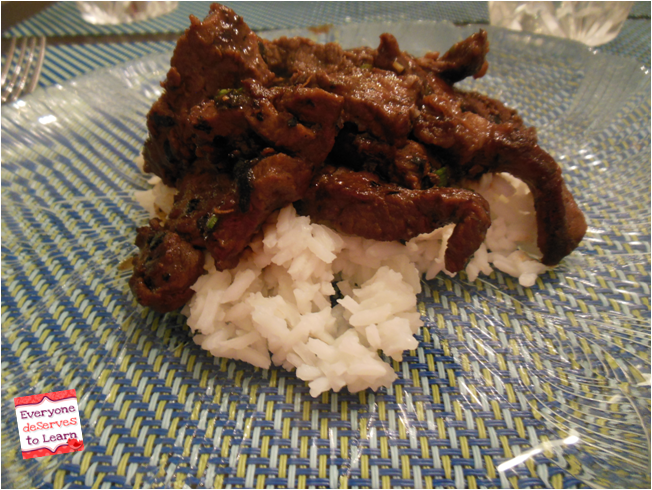 We used Ina's recipe...check it out here! 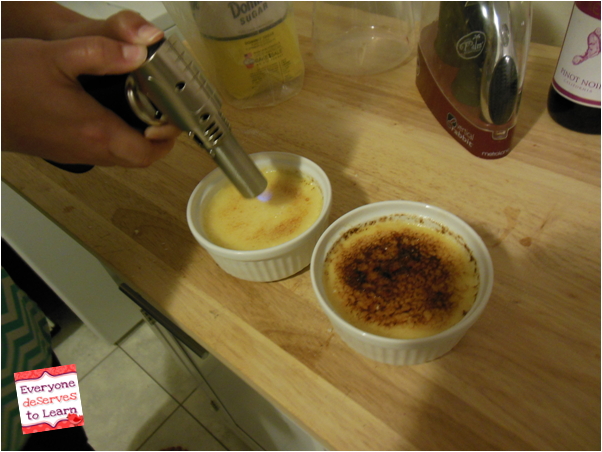 The brulee was an experiment in and of itself. It was delicious, but each pot took about 5 minutes to brulee and it's definitely supposed to be faster. We found out later that we were putting gas in the torch the wrong way, so we will have to try it again sometime. Poor us! A few weeks ago we went to Florida for the weekend, and I wanted a cross-body bag to travel with. So last-minute me went to Marshall's the night before our flight. Oh yeah, I did that. I was so proud of myself I wore that bag for two weeks after our trip just to show it off! What have you made recently? Link up with Tara! Teaching How-To Writing, Part 2! Crunch, yum, munch! 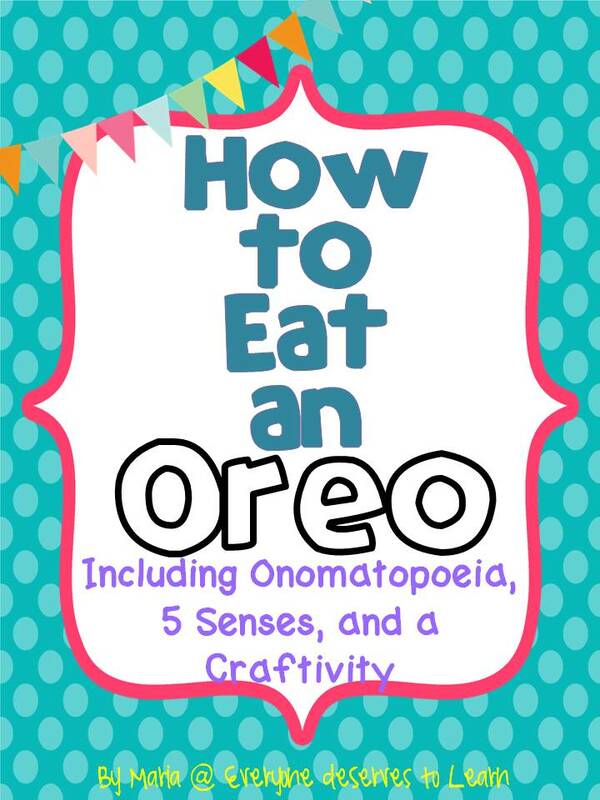 Last week I taught my students the magic of using onomatopoeia and the 5 Senses to spice up their how-to writing about Oreos. We started with a lesson inspired by Collaboration Cuties; read this poem (below) projected on my whiteboard, then read Honey Honey Lion, which I followed up with Click Clack Moo and Tap Tap Bang Bang. 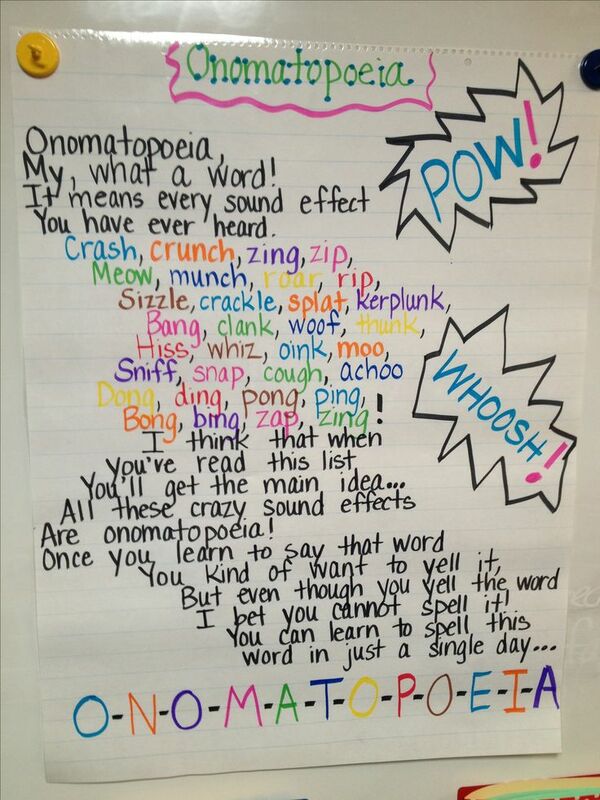 While the students were listening, I had them record onomatopoeia they heard on their recording sheet which you can find here for free! 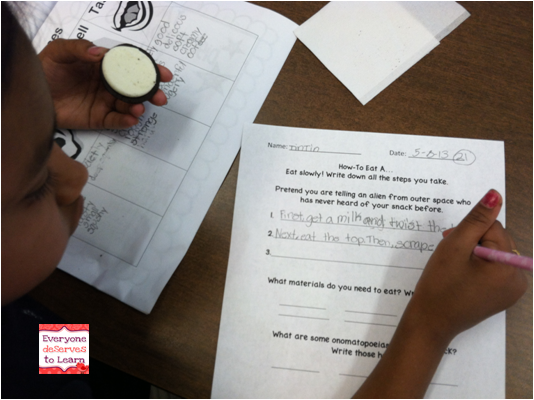 Next, we used a 5 Senses Graphic Organizer to record adjectives about our Oreo. I handed out one Oreo to each student, and they were under strict orders not to eat it until they had at least 5 adjectives for looks, smells, sounds, and feels. I had a couple of icing-swipers, though. Sneaky, sneaky. Finally, after the suspense was over, I gave them new Oreos (to be sanitary) and they got to eat those. It helped to display a list of common adjectives on the projector to give them a starting point- they came up with their own after seeing a few basic ones. The next day, all of my students got another Oreo. I projected my graphic organizer on the board, modeled how to eat my Oreo, think about what I just did, and then write it down, step by step. Well, that was harder than I thought it would be! I had to talk and eat and write at the same time...not easy. I ended up dropping my Oreo on the floor halfway through, causing my students to erupt with laughter and the next-door teacher to come and see what the problem was! They thought it was so funny, that in at least two of my students' essays it says, "Last, don't drop it on the floor like Mrs. M-C did." 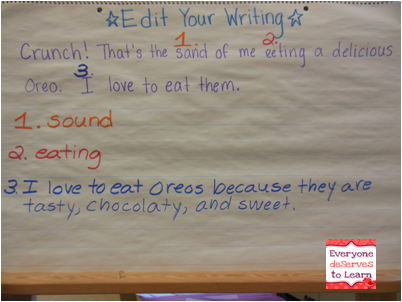 We talked about how, just like our last How-To writing, we need to pretend that our alien friend has never seen Oreos before. What can we do to make sure that we are making it perfectly easy and clear for him to understand? My students really take that to heart and are desperate to make the alien understand. 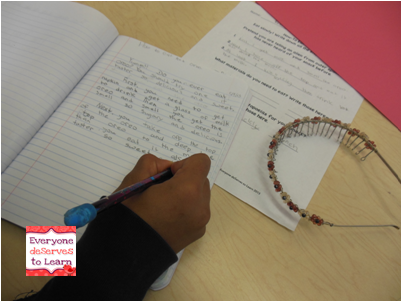 The fourth day, we started our first drafts. 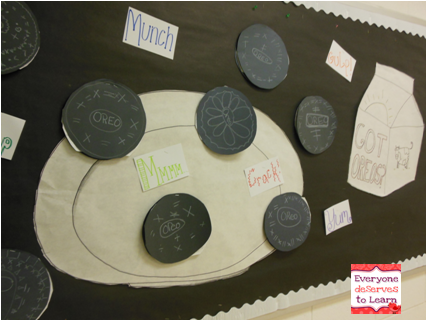 We used an outline from my How to Eat an Oreo Unit to lay out our paragraphs, then flipped back to our steps, materials, and adjectives to fill it all in. 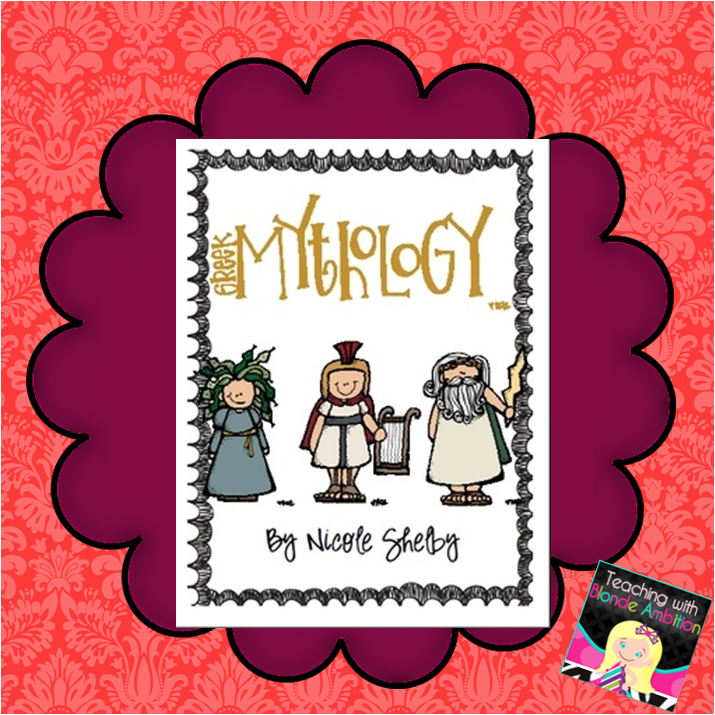 You can find my entire lesson plan, plus an original poem (different from the one above), a model essay, and the graphic organizers I used in the unit. When it came time to edit, I taught a (very) mini-lesson on a strategy my teaching partner taught her students, that I think is a fabulous idea. I only wish I had learned it earlier in the year! here's a student checking to see where my number edits should go. Some of my students had some anxiety when they saw that it was going to be 5 paragraphs, as they are used to writing 2-3 paragraphs tops. 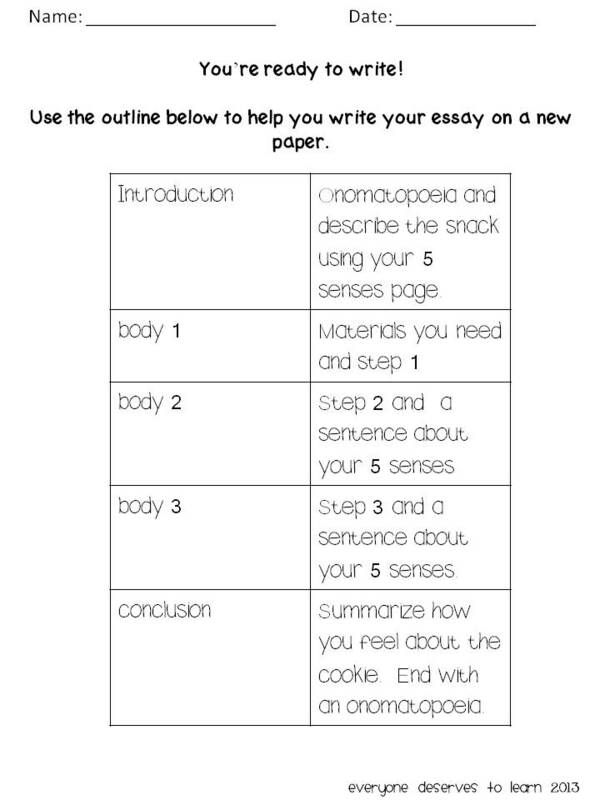 However, presenting it to them in a format they could easily follow, with all their information pulled from organizers they had already written made it much easier for some of my more reluctant writers. 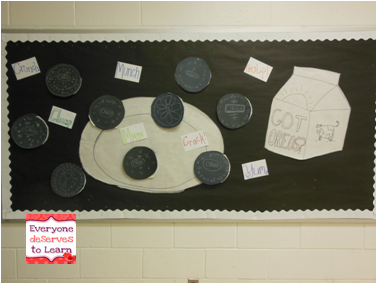 Here are some finished products, and our bulletin board. My students really enjoyed learning how to "how-to write" and I know they are better writers and more strategic thinkers because of it. Do you "How-To?" What kind of process writing do you teach in your classes? How do you teach editing? For more great writing ideas, check out my pinterest board! Follow Everyone Deserves to Learn's board ESL Writing on Pinterest. Thanks, Graphics From the Pond! 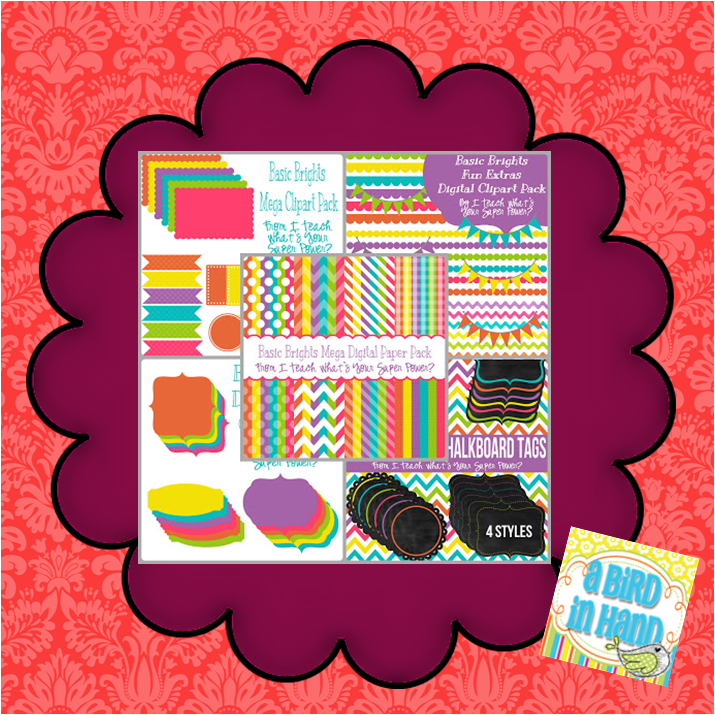 My store will be on sale for 20% off, plus TPT's 10% off which = 28%. What's on your wishlist? Happy shopping!